We’re having a very long spring here in the Pacific Northwest -at least in the Seattle area. Which means that, while I’m still waiting for that fresh local corn, there is still plenty of other good things at the market. 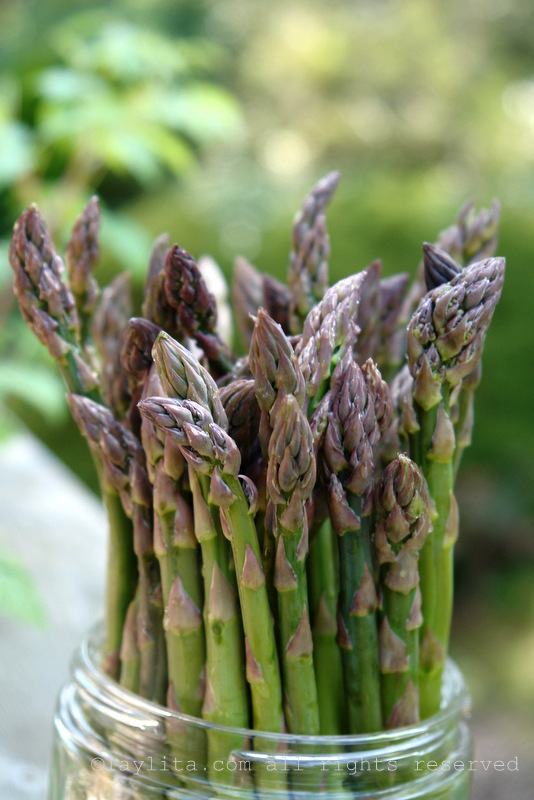 For example, there is a ton of asparagus, which (thankfully)my kids love and will eat non-stop. However, I still have to find different ways to prepare it, or at least a different sauce to serve with the asparagus, so that it doesn’t get too boring for them. 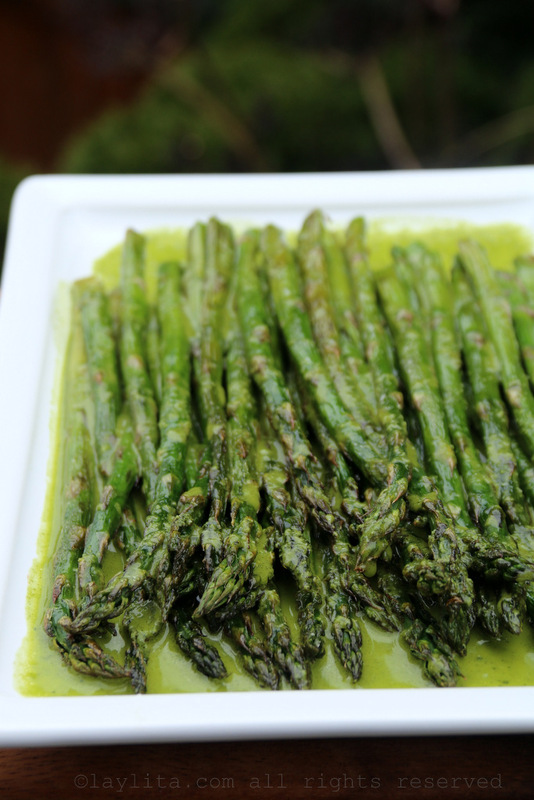 Easy and quick recipe for grilled asparagus with parsley lemon sauce. 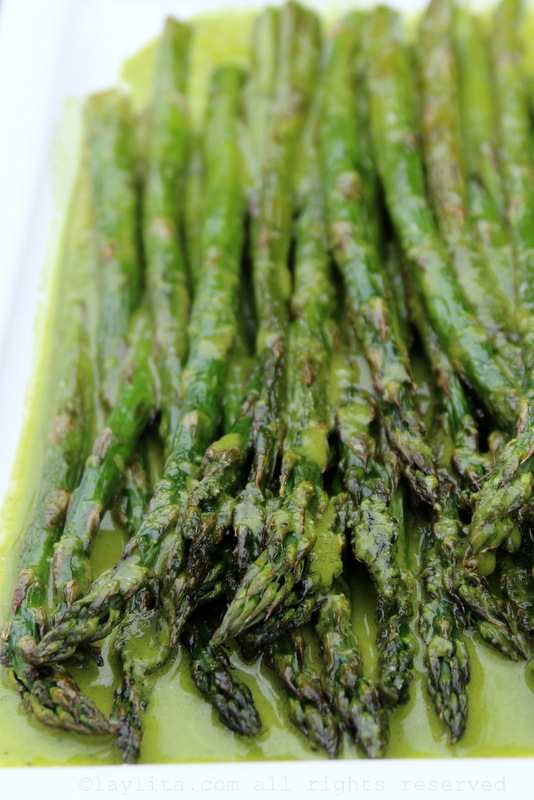 This grilled asparagus dish makes a great appetizer or side dish. 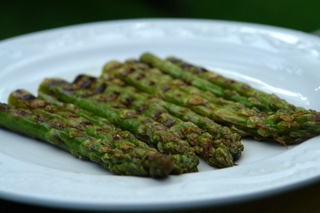 Toss the asparagus with the olive oil and salt, begin heating the grill. 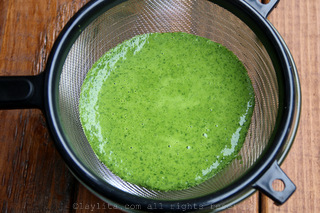 Blend the parsley leaves, garlic cloves, and lemon juice until completely pureed. 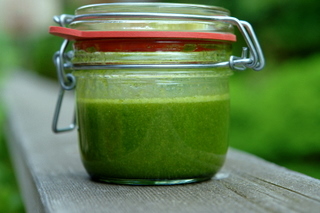 Strain the parsley sauce and place the strained sauce in a jar with the olive oil and the salt, shake the jar until the sauce is well mixed, refrigerate until ready to use. 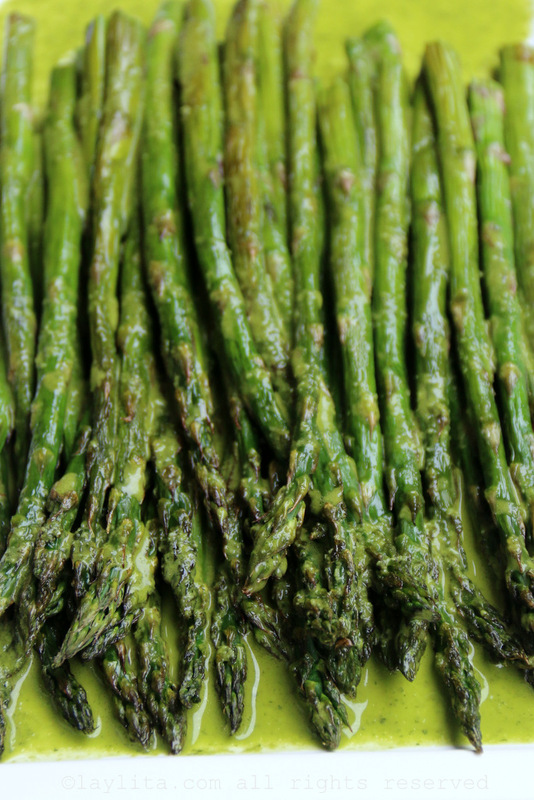 Grill the asparagus until tender and serve drizzled (or drenched) with the parsley lemon sauce. Any extra parsley lemon sauce will make a great dipping sauce for bread and can also be served with other grilled vegetables. Another good thing or place we have in Seattle is a Basque restaurant called Harvest Vine. 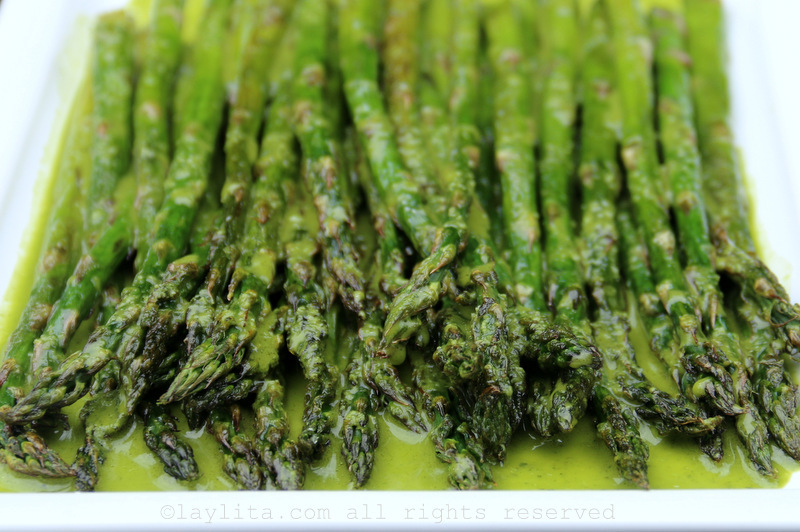 Back in April I had some of their grilled asparagus and it was just perfect, very simple, but sooooooo good. 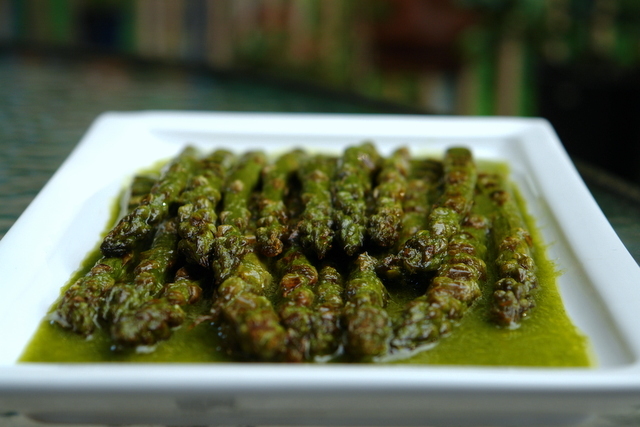 On the plate with the grilled asparagus there were these tiny drops of a bright green sauce, which from the taste had to be made with parsley, lemon juice, maybe a little olive oil. The parsley sauce was great, the only problem (for me) was that there wasn’t enough. I love sauces and think people should be generous with sauce (I guess I could have asked for more but I didn’t). So just like when you have a crepe with Nutella at a restaurant, and they give you a tiny bit of Nutella, and then when you get home and the first thing you do eat it directly from the jar by the spoonful. 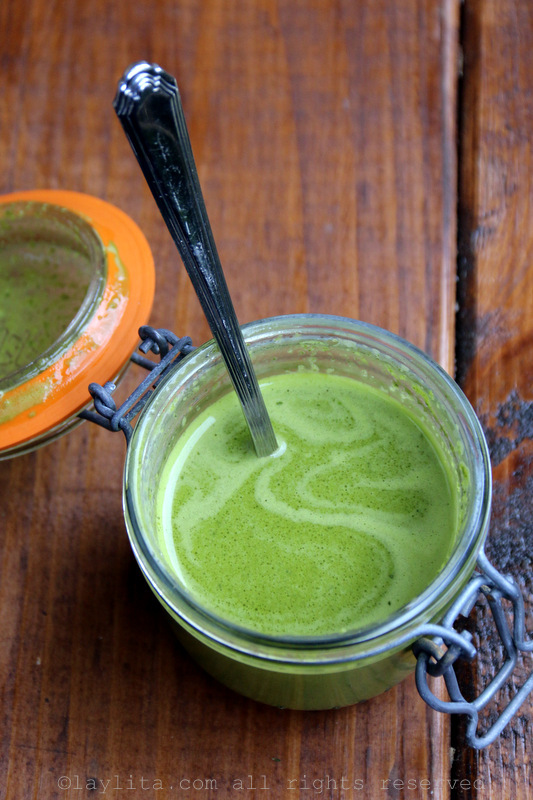 I decided to make my own version of that parsley sauce. Just so I could completely drench my grilled asparagus in it. There was some sauce leftover from the asparagus, so we ate it with bread and finished every single drop. 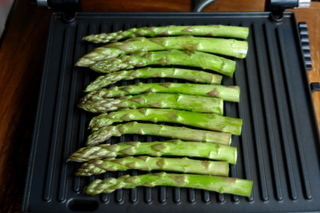 If I’m lazy/impatien or it’s cold outside, I will use a small electric grill to make the asparagus. 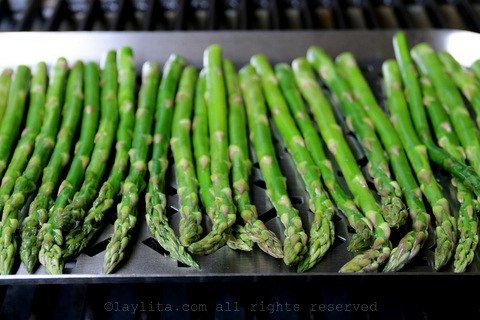 If making it on the proper grill, then I recommend using a grill plate or platter to keep the asparagus from falling into the grill, plus it makes it easier to turn them. 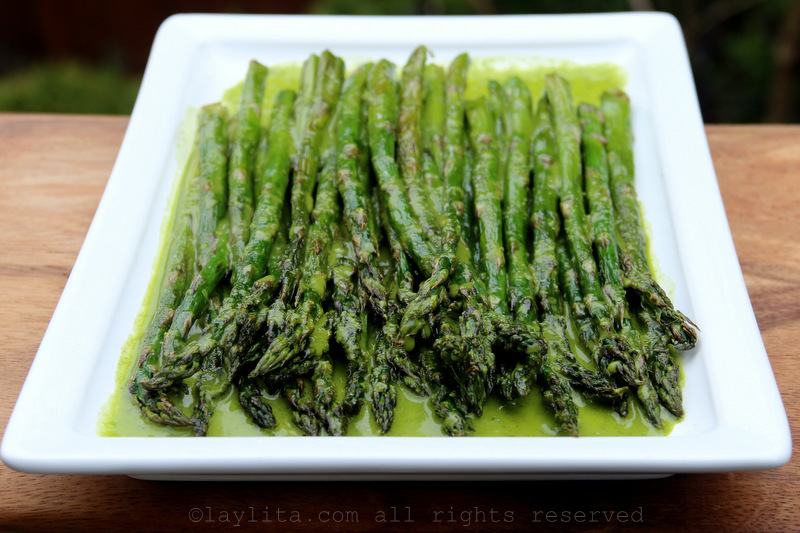 This grilled asparagus with parsley sauce can be served as an appetizer or as a side dish. The parsley lemon sauce also goes great with other grilled vegetables. 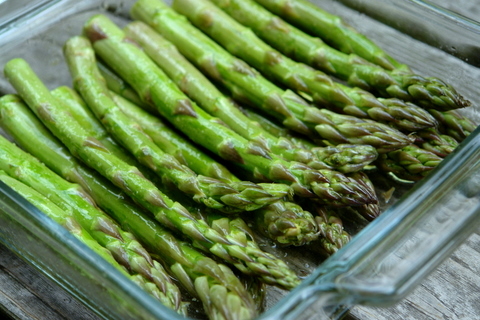 What is the serving size for 1 bunch of asparagus..
As an appetizer or side dish, 1 bunch of asparagus will serve 4 people. Great idea. I’ve a fridge full of asparagus and wanted to make parsley sauce tonight. I’m vegetarian and was wondering what I could have the sauce with that I hadn’t tried. Thanks! 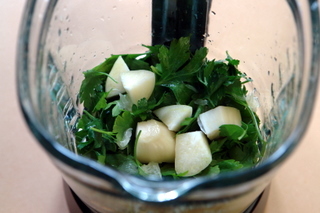 I HAVE FOUND THAT YOU CAN MAKE THE PARSLEY SAUCE USING THE STEMS AS WELL AS THE LEAVES. JUST CUT OFF THE ROOT ENDS, WASH WELL, SHAKE DRY AND PUT IT ALL IN THE BLENDER WITH THE OTHER INGREDIENTS. Yum! I like the sound of the parsely sauce with the asparagus. I definitely have to try this. Thanks! Beautiful! As always, love the photos. 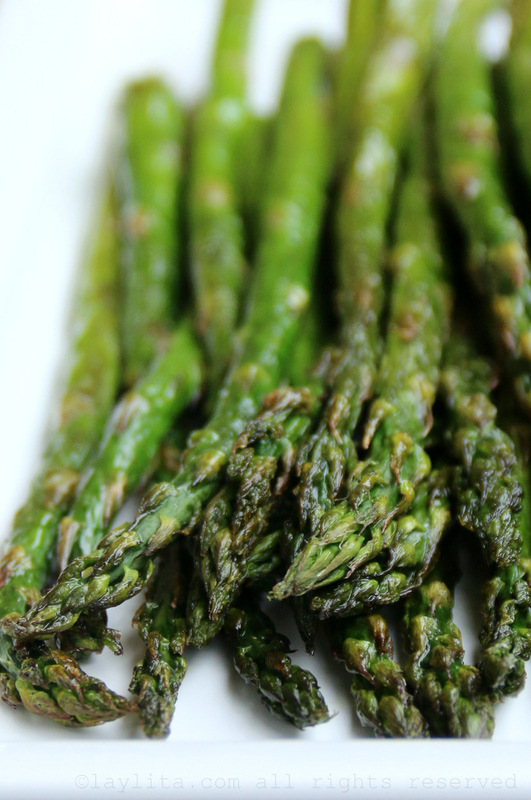 We are still gorging on asparagus too. It has been, as you say, quite a long spring here. Only yesterday was I able to purchase some (long-delayed) local strawberries. 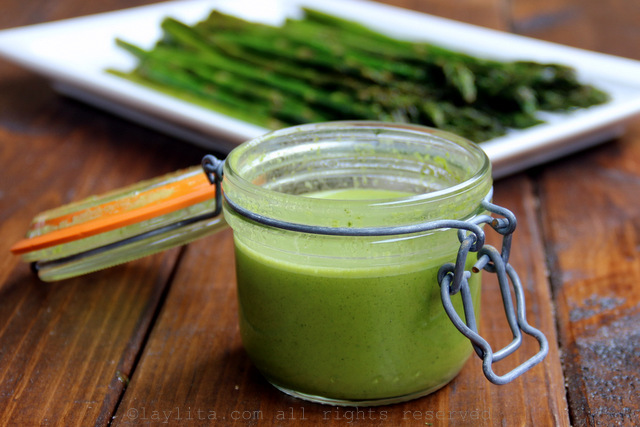 I have had this parsley sauce over quartered hard boiled eggs, which was pretty for an Easter dish but I like the idea of using it on the asparagus. 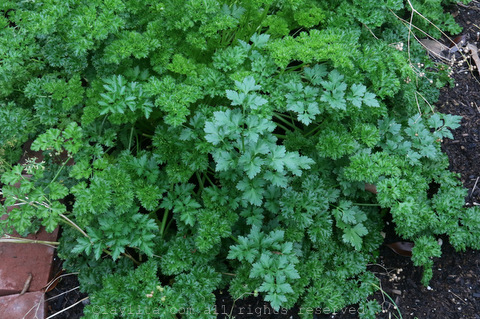 Once my parsley comes up in the garden I will have to try, sounds very refreshing. A very refined dish! Really tasty!